Fall colors in Michigan's Upper Peninsula are astonishing. Quality Inn and Suites of Newberry invites you to come and experience our colorful season throughout the Tahquamenon Area. 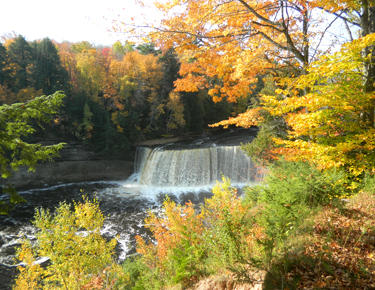 Visit the many various places of beauty in the fall surrounding the Newberry area, the Tahquamenon Falls, Paradise, Grand Marias, Brimley, Munising and Manistique. You'll "Fall" in Love with Newberry in the autumn. 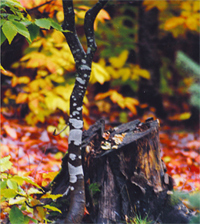 Your eyes will be dazzled by the magnificent canvas of color created by the Upper Peninsula climate and changing leaves. Make time to enjoy all of the seasons that our Tahquamenon area has been blessed with. Let the beauty of Michigan's Upper Peninsula unfold before your eyes. 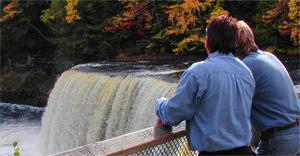 If you have seen the Falls, but have not enjoyed its splendor in the Fall, then don't hesitate to come and enjoy the views of colors and hues that will captivate you as you walk down to the natural wonder and gaze upon the forests and trees surrounding it. Along with visiting our Color Tour Report, also check out the many events that occur during the fall season. Great Activities and Events include: The Tahquamenon Logging Museum Fiddlers Jamboree, Paradise Tahquamenon Wilderness Canoe Race, The Luce-West County Mackinac Fair, The Wild Blueberry Festiva in Paradise Michigan, and the Anuual Haunted Trail - Also in Paradise.